«The eagle is the longest-living bird of its kind; he gets to live 70 years, but to reach that age, at 40, he must take a serious and difficult decision. After four decades of life his nails become tight and flexible, without being able to take his prey with which he feeds. Its long pointed beak curves against its chest, its wings age and become heavy and thick feathers. Fly is too hard for him. Then the eagle has only two alternatives: to die or to face its willful process of renewal, which will last 150 days. This process consists of flying to the top of a mountain and staying there, in a nest near a wall, where there is no need to fly. Then, finding himself in the place, the eagle begins to strike with its beak on the wall until it is able to pull it out. After doing this, he will wait for the growth of a new peak with which he will detach one by one his nails heels. When the new heels begin to be born, begin to pluck their old feathers. Finally, after five very hard months, he leaves for the famous renewal flight that will give him 30 more years of life ». 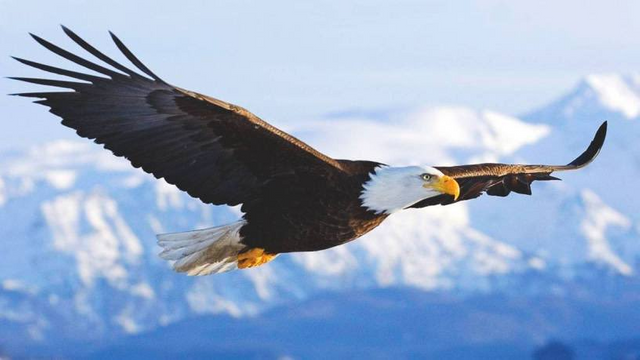 This beautiful story of the eagle, made me remember that our heavenly father makes us raise as one of them, yes, when sometimes the strength is over, when the faith wanes, when we do not see clearer days than midday in our lives When pain and sadness invade our heart, these difficult circumstances that we sometimes have to go through remind me of that beautiful bird. Occasionally we have to do as the eagle does away, remove the old plumage, the old beak those old nails, and what are those feathers and nails that we have to get rid of ?. Well, everyone can easily identify them in their lives: they are those attitudes, vices and customs that prevent us from changing, that tie us to the past, to mediocrity to the lack of courage to start the fight. In others it may be resentment, complex, low or high self-esteem, which cloud our eyesight and the ability to be objective with ourselves. We must get rid of customs, traditions and memories that cause us pain, renew and wait, if we wait for the new plumage, the new nails, the new peak that will make us rise again to the place where God was supposed to determine that we should be and fight against fear that is our worst enemy, which sometimes prevents us from positioning ourselves in the right place. Only free of the weight of the past can we take advantage of the valuable result that a renovation always brings. Like eagles, we also sometimes need to undergo a process of renewal in our lives to rid ourselves of dead and unnecessary weights and things that do not allow us to grow spiritually. When God renews us, He cuts fruitless things in us to make us more fruitful. What fruits are we talking about? They can be peace, love, joy, kindness, honesty, compassion, self-control and many more. We will begin to understand that difficult times in life, which are very unpleasant and painful, can be used to teach us and change us into better people. So we should not try to flee from suffering, but cooperate with God by believing in his word that says: "All things work for the good of those who love God" (Romans 8:28). and finally the eagles do not fly, they go back. Instead of using their own strength and moving their wings like other birds do, they use the currents of the winds to fly high. The eagle sits on the rock and "reads" or "studies" the wind. When the time is perfect it rises and rises with its great wings. Effortlessly, just expanding your wings and rising higher and higher towards the sky. The Bible refers to the Holy Spirit of God as a wind. We can cooperate with the Holy Spirit and allow the Word of God to lift us closer to Jesus. We can not improve our lives by our own efforts, if not allowing God to do so. But those who wait for Jehovah will have new strength; they will raise wings like eagles; they will run, and they will not get tired; they will walk, and they will not tire. Reflection of stimulus @mariela we are a type of eagle renewed whenever it is necessary. We were born to fly high. Before now, i didn’t know that eagles 🦅 participate in their renewal process! God has given us the same ability to strive and to contend for our most holy faith, and through the process, we’re renewed! Amen @junfer blessing and be like the eagle!! !